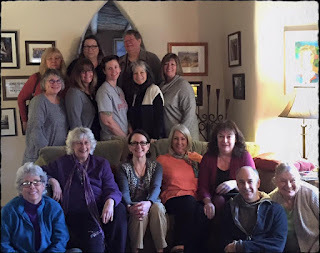 I have been back from my retreat with Roxanne Evans Stout in Taos for just over a week and it is still in my bones. The experience will be with me for a very long time. 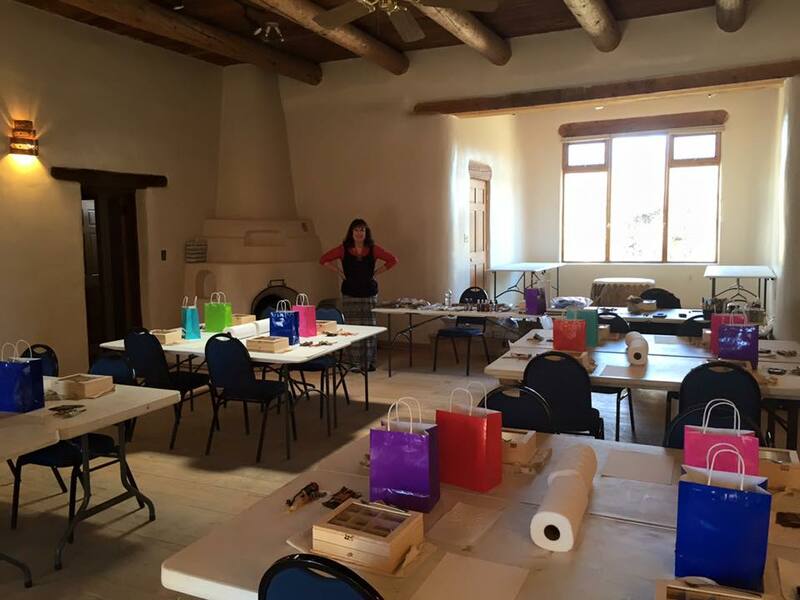 In earlier posts I shared with you the beauty of Taos and the Magic of the venue: Mabel Dodge Luhan House. 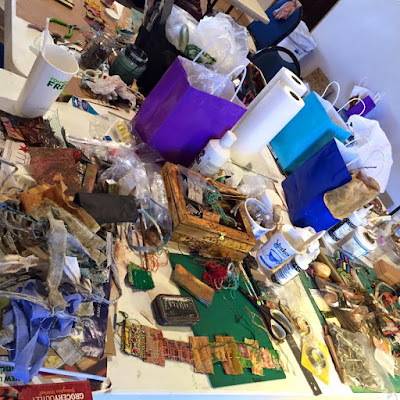 Now I want to share the workshop itself: A Case of Curiosities. The building we were in was a beautiful, traditional adobe. The room itself couldn't have been nicer. Well...it got nicer after it started to be used! And even nicer in closeup. 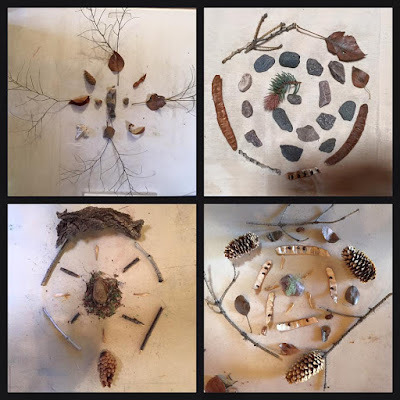 The first day started with everybody collecting nature from the property and creating mandalas. 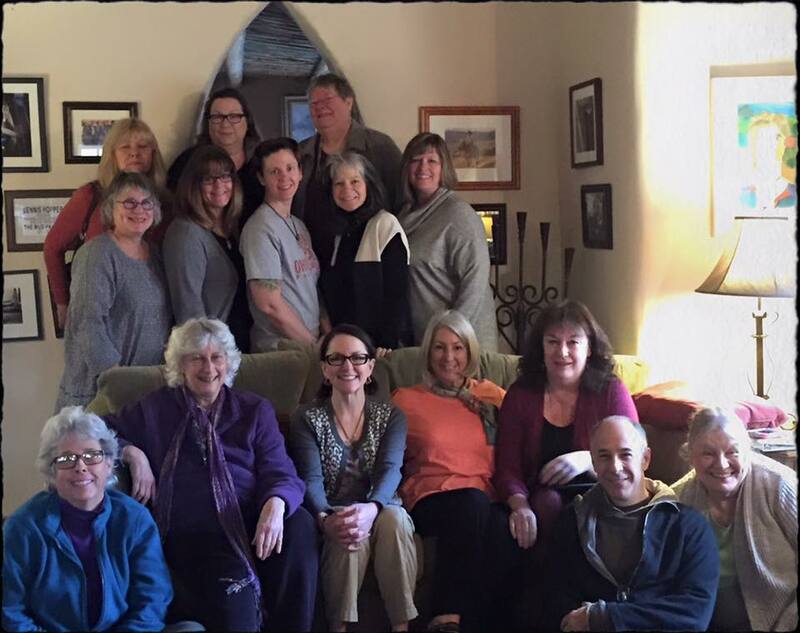 The retreat was called A Case of Curiosities. Everybody had a wooden box with a hinged, glass-filled cover, many small compartments, and a drawer. People painted and distressed their box and then worked on small projects to go inside. This once in a lifetime experience will be at least twice in a lifetime. Roxanne and I are bringing A Case of Curiosities II to the Mabel Dodge Luhan House in Taos, New Mexico again in 2017. Looks wonderful! Wish I was there! Wow. What dreams are made of. I started my own Cabinet sometime ago and this wonderfully inspiring post has just kick started it.Thank you for sharing. So generous. WOW what great photos and what a fabulous time this had to be on so many levels. 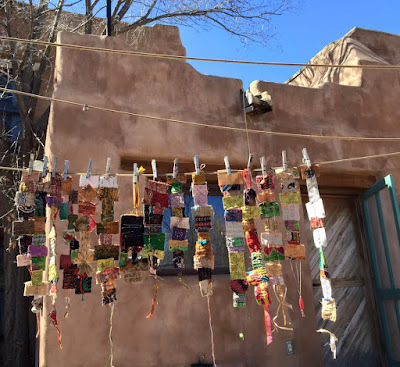 I am really taken with The Land of Enchantment and the Taos area holds special magic for sure. Lucky lucky ones to get to be there with you and Roxanne! Thank you for sharing Seth. Truly a very special event and precious memory. The creative ghosts would have enjoyed the fun! That all looks fantastic! The photos of the little books opened up looks like a flock of butterflies about to take off. What a fabulous event for you all. Thanks for sharing all these wonderful pictures with us. An absolute cornucopia of delights. How wonderful!....and in such inspiring surroundings too. Wow! What a wonderful thing to do. Such treasures. I'm excited about the news that you will do this again next year. 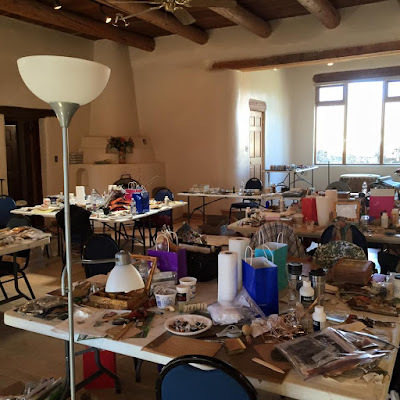 It's been on my top 10 bucket list items to go to an art retreat at the MDLH for awhile now. This would be the perfect opportunity. So glad you all had such a great time. Taos is such a beautiful, mysterious, grounded place. Sounds like an amazing creative time! Very interesting work coming out of there. So much eye candy! It was a week I will always remember! 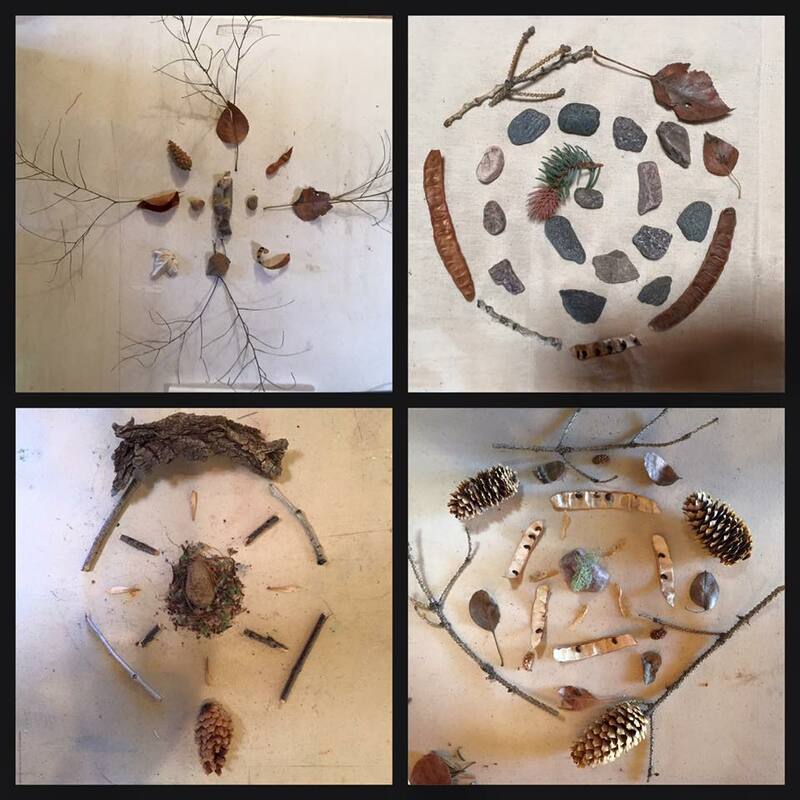 Thanks so much for sharing all this Fantastic ART and Creativeness! You are the BEST! Seth! It was an amazing post and I love seeing all the artwork here in all of its glorious beauty! Unforgettable and amazing. 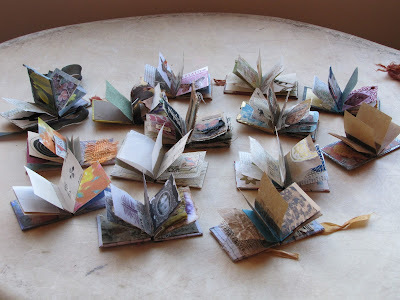 Such beautiful, creative art! It all looks so wonderful! I wish I could attend a seminar just like this one. It looks like it was right up my alley. You have the best projects!